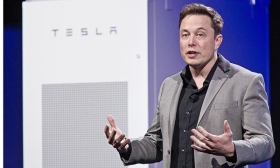 Klaus Grohmann disagreed with Elon Musk's demands to focus management attention on Tesla projects. FRANKFURT -- Tesla executive Klaus Grohmann was ousted last month after a clash with CEO Elon Musk over the strategy of Grohmann's firm, which Tesla had acquired in November, a source familiar with the matter told Reuters. At the time of the purchase, it described Klaus Grohmann and the company he founded as a "world leader in highly automated manufacturing." Reached by phone, Klaus Grohmann declined to comment on the circumstances of his leaving, citing confidentiality clauses. "I definitely did not depart because I had lost interest in working," Grohmann said, without elaborating. The German labor union IG Metall has demanded that Tesla's management formalize multi-year job guarantees and increase salaries as a way to provide assurance amid management turmoil.